Hardinge Sure-Grip Power Chucks are lever-operated, counter-centrifugal and dynamically balanced. This enables you to continually operate your CNC lathe at higher spindle speeds and feed rates with less concern for loss of jaw force normally associated with wedge-style chucks. Sure-Grip Power Chucks mount directly to ANSI A2-4, A2-5, A2-6 and A2-8 spindles, eliminating the added tolerance buildup when using special adapter plates. Sure-Grip Power Chucks come standard with 1.5mm x 60 serrated master jaws designed to ISO specifications. Quick-change chucks available. 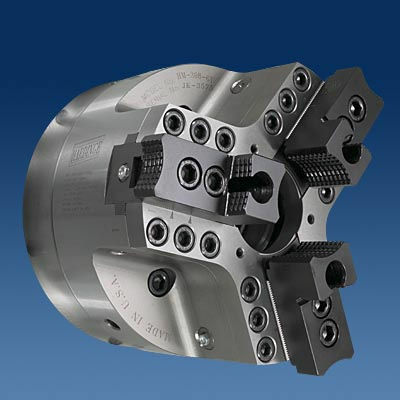 Hardinge manufactures a complete line of jaws for all brands of chucks.